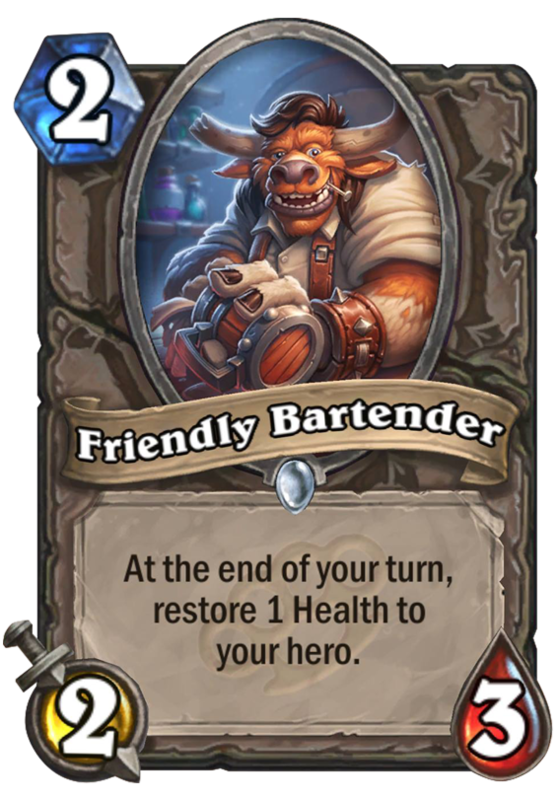 Friendly Bartender is a 2 Mana Cost Common Neutral Minion card from the Mean Streets of Gadgetzan set! At the end of your turn, restore 1 Health to your hero. Rating: 2.7/5. From 1342 votes. Most under rated card in the set. 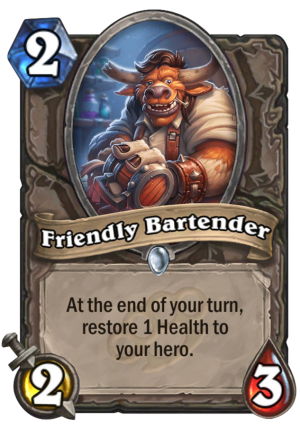 He will see plenty of play in control and is super solid anytime as a 2 drop. Could be interesting in zoo as well… good stats and a genuinely useful effect. While I understand why people don’t think much of this card, as a Priest I can appreciate the idea behind it. With a Heal Priest, one big problem is having nothing to actually heal to buff minions. However, by using small, over time healing, more healing can be done over time, and more buffs can be applied. You’re facing an opponent, their hand is empty, board cleared, and you’re at full health. You can’t buff anymore., Solution? 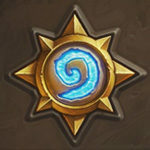 Small healing that keeps your hero purposely somewhat damaged to allow ot to be healed again.